Learn more about our upcoming and recent plays by clicking on the images below! We're thrilled that our newest collaborative creation, If You Do This Right You'll Probably Break Their Chest, was featured at Ars Nova's ANT Fest on June 6th. Click the poster below for more information. After a successful run at The Peoples Improv Theater, Unpacking: A Ghost Story Told in the Dark had a successful 3-week run at HERE Arts Center as part of their SubletSeries. A happy couple has just moved into their new home. But the novelty of homeownership quickly fades as they face a sea of boxes, a major blackout, and, shortly thereafter, the ghosts of all their past relationships. The newest play from comedians Marina & Nicco combine two of your biggest fears: the dark and commitment. The audience lends a hand by lighting the stage for a couple that is literally, and figuratively, feeling their way through the dark. After a successful workshop production, Room 4 returned to The PIT for a 4-month run, during which it was celebrated as a New York Times critic's pick. The Academy Awards has a race problem. It’s big. But the four black actors in Room 4 aren’t particularly concerned with that, because they have a much bigger problem at hand. They’ve just realized they’re stuck in a time loop, auditioning for the same “Drug Dealer #2” role over and over. What once felt like a messed-up metaphor has become a literal existential nightmare. Get them out of there. It’s funny, but a little angry, but mostly funny. Standing By was the final play in Marina & Nicco's six-month writing residency at The Peoples Improv Theater, in which they wrote and produced a new play every month for six months. This is Jane. Jane is a good person. Jane is so good she takes a date she didn’t even like to the emergency room. Now Jane waits. Wait, Jane, wait. This is Oliver. Oliver just failed his life’s mission and is now also in this hospital waiting room. Fail, Oliver, fail. This is 3am. See what happens. “Standing By” is Marina and Nicco’s final play in their six-month residency at The PIT. It all ends here. 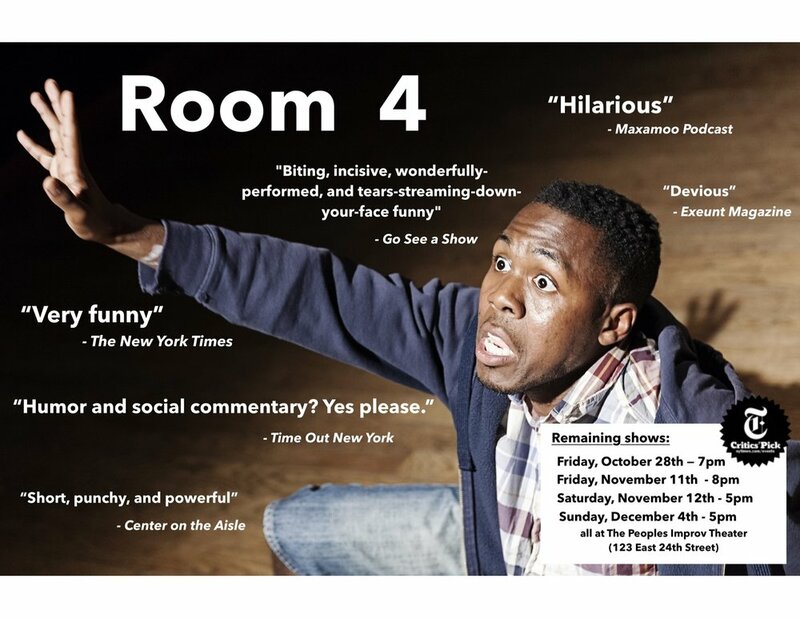 Room 4 was originally performed as part of Marina & Nicco's six-month writing residency at The Peoples Improv Theater. Click the image before for more information on the workshop production. The Night Club, which was part 3 of Marina & Nicco's six-month writing residency at The Peoples Improv Theater, was a 360-degree, immersive theater experience. Scavenge for ideas, forge a script, hunt for a stage, get the audience in, realize you spent more than you made. Repeat. After the long, brutal hunt for a venue, the comedians who get stage time at The Night Club are so thankful they don’t even mind not getting paid. At least the younger ones don’t. The older comedians are at the end of their rope -- and they’re going to make things change. This was the second production in our 6-month playwriting residency at The Peoples Improv Theater. Ally falls in love quickly. First she falls in love with a charming actor named Chris she meets at an office party; then she falls in love with the charming part he plays on a hit TV show. But when his character is killed off, she and Chris are forced to re-assess the roles they play for each other -- and if they want to keep performing after all. Most TV shows only last five seasons. Should their relationship be the same? MURDER! was our eight-part murder-mystery-comedy radio play. It was performed at The Peoples Improv Theater with live music and Foley. This zany play was about three astronauts desperately trying to get NASA to repair their wifi.